Drilling rig employees work on a project last summer in the Parachute area. A new plan by the U.S. Forest Service will determine how much land can be leased on the 2.3-million acre forest. About 61,000 acres of land in Thompson Divide southwest of Carbondale with high potential for oil and gas resources will be closed to drilling, White River National Forest Supervisor Scott Fitzwilliams announced Tuesday. The closure of the Thompson Divide lands was part of the Forest Service’s broader draft plan that will dictate how oil and gas leases are handled on the sprawling 2.2 million-acre White River National Forest. The draft decision and Final Environmental Impact Statement were released Tuesday after four years of analysis and work. The decision partially addresses a long-running feud between a coalition of ranchers, sportsmen, outdoors enthusiasts and hippies aligned against SG Interests and Ursa Resources Co., two companies that hold leases and want to drill in Thompson Divide. “I think it’s a big victory for this broad-based coalition,” said Zane Kessler, executive director of the Thompson Divide Coalition. The Forest Service decision is the result of what happens when people “stand united for a cause,” he said. However, the decision applies only to future leasing. It doesn’t affect lands that are already leased. About 61,000 acres of Thompson Divide lands in the White River National Forest and additional lands in an adjoining forest are already leased, Kessler said. The Forest Service’s draft plan will dictate oil and gas leasing for 15 to 20 years over the whole forest. It replaces a plan that was approved in 1993. The new plan would reduce the overall amount of the land administratively available to oil and gas companies for leasing from 417,000 to 194,123 acres, according to the draft record of decision. That means about 8.5 percent of the entire forest would remain available for leasing. “To the extent practical, my decision aims to minimize the impacts to the natural character of the White River National Forest and still provide opportunities for oil and gas leasing and development in high-potential areas,” Fitzwilliams wrote in his decision. Under conditions of the plan, the White River would have 800,555 acres legally closed to leasing because they are designated wilderness, permitted ski areas, campgrounds or administrative sites. Another 1,281,726 acres will be closed for leasing by management direction. That includes lands in the Roaring Fork Valley, such as Hay Park, and lands in the Crystal Valley, such as Coal Basin, Fitzwilliams said. There is little or no potential for production on those lands because of geological traits, according to the Forest Service. Kessler said every acre of Pitkin County land within Thompson Divide will be protected, as well as 80 percent of Garfield County land in the divide. The land that Fitzwilliams withdrew from leasing wouldn’t necessarily be permanently out of play for the oil-and-gas industry. Fitzwilliams’ decision could be altered when the oil and gas lease plan is updated. Only Congress can permanently remove lands from leasing. The plan’s effects on the forest go beyond removing some lands from leasing. It sets limits on when drilling can occur and it requires no surface occupancy on parcels such as roadless lands. That will reduce road building, pad construction and other disturbances that require direction drilling, according to Fitzwilliams. Peter Hart, staff attorney with Wilderness Workshop, the oldest homegrown environmental group in the Roaring Fork Valley, said the decision was important because it protects roadless lands as well as Thompson Divide. He said it was a victory for Wilderness Workshop, even though the organization wanted the entire forest closed to future leasing. “Not a full victory, but a significant one,” Hart said. David Ludlam, executive director of the West Slope Colorado Oil and Gas Association, said it is a “false choice” to say there can be drilling or preservation of the natural character of the land. They aren’t mutually exclusive, he said. It has been demonstrated numerous times in Colorado — such as around Durango and in Routt County — that gas production can occur without ruining the land for recreation, hunting and fishing, Ludlam said. Don Simpson, vice president of business development for Ursa, said his company didn’t have any comment about the Record of Decision. The 194,123 acres that remain administratively available for gas and oil leasing are mostly in Garfield County, south of the towns of New Castle, Silt, Rifle and Parachute. In addition, 131,141 acres are already leased. Fitzwilliams said the lands that can be leased tend to be close to areas where drilling has already taken place and where infrastructure exists. He said it is impossible to tell how much drilling will be proposed on forest lands given the low price of gas and discovery of large deposits elsewhere in the country. “We don’t expect to be out of the oil and gas business over the next 15 to 20 years,” he said. Fitzwilliams said he tried to balance the issues raised by multiple parties with interest in the management of the forest, from gas companies to environmental groups and hundreds of people in between. “My draft decision places an emphasis on conserving the roadless character, wildlife habitat and recreation opportunities of the White River National Forest while providing oil and gas development opportunities with a focus on lands that have proven to be productive in the past 10 to 15 years,” Fitzwilliams wrote. He said he received a substantial number of comments supporting preservation of Thompson Divide. There aren’t any drilling rigs currently operating on the White River National Forest. 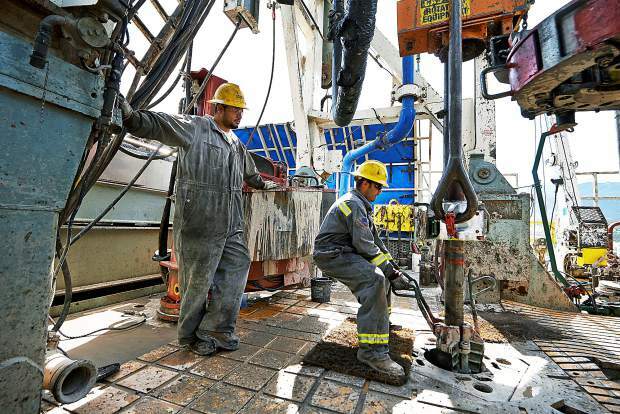 The supervisor’s office has prohibited new drilling until the Bureau of Land Management determines the status of 65 leases issued after 1993. Conservation groups said those leases were issued illegally because they didn’t comply with protections on roadless lands. Ludlam said the Forest Service’s decision to withdraw lands for leasing on Thompson Divide came as no surprise to his organization or the gas industry. The decision was expected as a way to provide the BLM with a “pathway” to determine the 65 parcels were allegedly not lawfully leased. By determining that no new lands will be leased in Thompson Divide to preserve their character, it will provide the BLM with an opportunity to follow suit on the existing leases, Ludlam said. The trade group hasn’t decided yet if it will file a formal objection to the record of decision, he said. Objections must be filed within 60 days of a legal notice running in the Glenwood Springs Post Independent. Fitzwilliams said that will likely be Friday. If no objection is filed, the decision will be finalized and implemented after that 60-day period. If an objection is filed, the regional forester will have 90 days to answer.